I post an image of something I have physically seen. Currently, it is typically something from my grandmother trunk of photos and clippings. I then transcribe, extract, and/or analyze it. For this week’s Treasure Chest Tuesday, I’m looking at “DSCN1419” from the Donna Darling Collection. There were five items on this page. Loew’s … On the Stage – Donna Darling The Scintillating Beauty in “Her Jewel Review” and two other big acts. 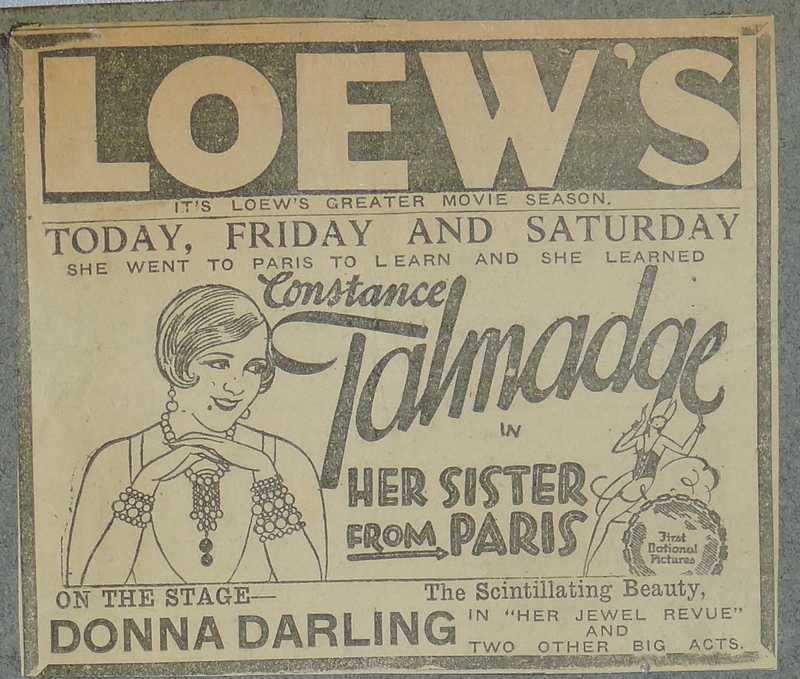 The accompanying movie was Constance Talmadge in “Her Sister from Paris.” There were many Loew’s Theatre’s, so it isn’t clear which of the 147 Loew’s theatres this one was[i]. The second and third clippings provide the answer. 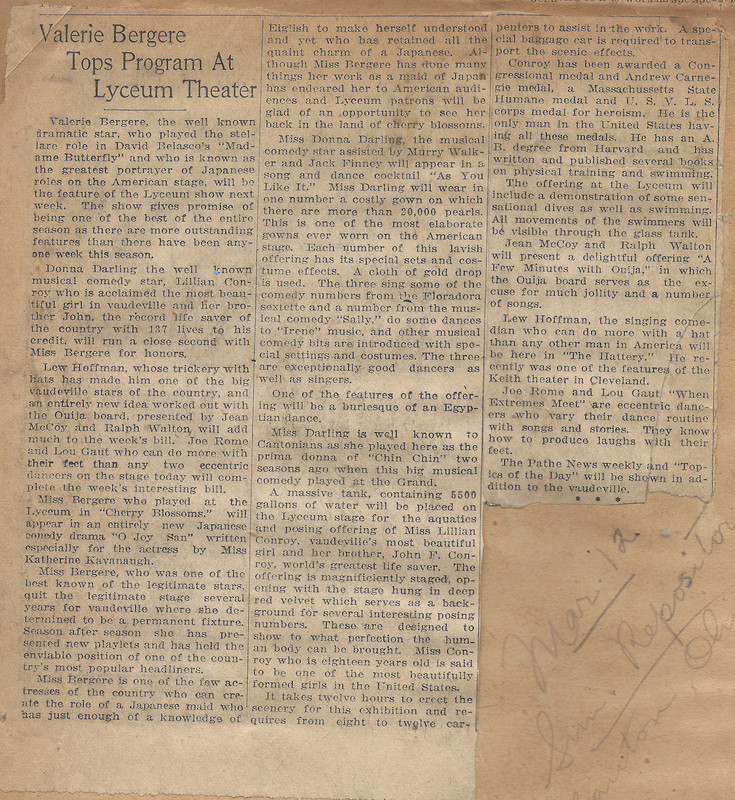 One is a long, thin page header which indicates, “London Evening Advertiser, Friday, February 26, 1926.” The other is an article, “At the Theatres,” which describes what was playing at Loew’s Theatre. 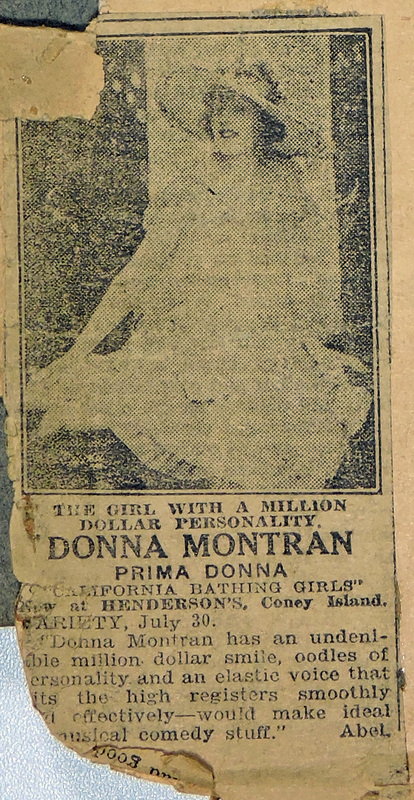 Together, with the advertisement clipping, they show Donna played at the Loew’s Theatre in London, Ontario, from February 25th through the 27th, 1926. Donna Darling Revue is one of the best dancing and singing acts seen at Loew’s for some time. All the girls are beautiful, and they can dance. Miss Darling proves her versality by appearing in four different roles, singing and dancing in each. A splendid selection of costume dances brings calls for many encores and on the whole the girls prove a huge success. Further searching on Cinema Treasures, indicated there was a Loew’s Theater, which was built in 1924, existed in London Ontario. I know that Donna played at the Capitol Theatre in Toronto, Ontario, from February 8th through the 13th, and at the Colonial Theatre in Detroit from February 28th through March 3rd, so her playing in London between them makes sense. Sammy Clark, c. Feb 1926. The fourth image was one of her dog. The photo was severely damaged over time and not worth trying to clean it up. The final image was one of her husband, Sammy. It is a lovely photo that adds to my collection of Sammy photos. Long coat, hat, gloves, he looks so gangster from the 1920s. He clearly dressed in the style of the mid-1920s. February 25-27, 1926 – Loew’s Theatre, London, Ontario – Donna Darling in “Her Jewel Revue” added to Donna’s list of performances. Research Loew’s Theatre in London, Ontario and write about her show there and the theatre. For this week’s Treasure Chest Tuesday, I’m looking at another news clipping from the Donna Darling Collection. …. Donna Darling the well known musical comedy star…. … Miss Donna Darling, the musical comedy star assisted by Murry Walker and Jack Finney will appear in a song and dance cocktail “As you Like It.” Miss Darling will wear in one number a costly gown on which there are more than 20,000 pearls. This is one of the most elaborate gowns ever worn on the American star. Each number of this lavish offering has its special sets and costume effects. A cloth of gold drop is used. The three sing some of the comedy numbers from the Floradora sextette and a number from the musical comedy “Sally,” do some dances to “Irene” music, and other musical comedy hits are introduced with special settings and costumes. The three are exceptionally good dancers as well as singers. One of the features of the offering will be a burlesque of an Egyptian dance. The venue is the Lyceum Theater. The show is the “As You Like It” starring Donna Darling assisted by Murry Walker and Jack Finney. Miss Lillian Conroy & her brother John used a 5500-gallon water tank for an aquatic show. Joe Rome & Lou Gaut show “When Extremes Meet” as dancers, singers & storytellers. I always love it when Donna writes the source information on the clipping page. In this case, she wrote “Mar 12 – Sun Repositor – Canton, Ohio.” This matched perfectly with a show I already knew about. On March 12-16 she played at the Lyceum Theater in Canton Ohio. The article included some interesting tidbits. In particular, I had not previously known that her dress had “over 20,000 pearls.” Wow, that must have been quite the dress. March 12-16, 1922 – Canton, Ohio – Lyceum – Donna Darling – Genealogy Bank – DDC – Part 45. For this week’s Treasure Chest Tuesday, I’m looking at two clippings from the Donna Darling Collection where she played at the Lindo Theater. 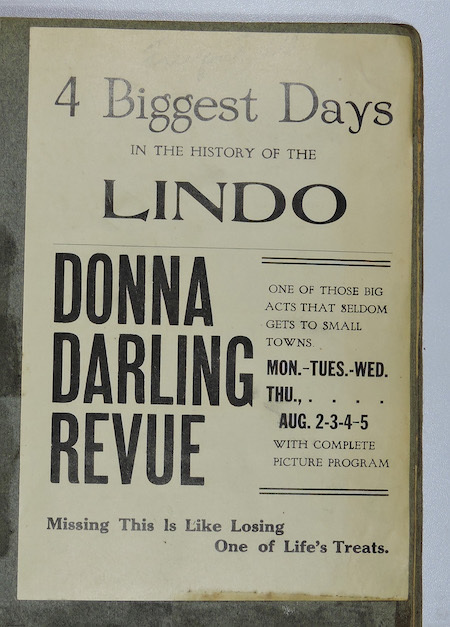 The first is a newspaper clipping which advertises The Donna Darling Revue playing for 4 days at the Lido. 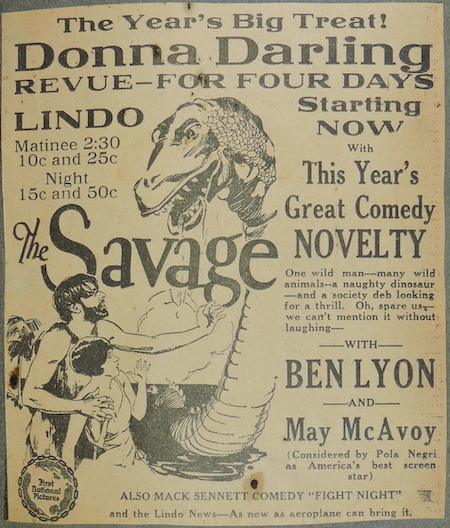 at the same time as “The Savage” a comedy novelty movie. According to IMDB, the film was released on 18 July 1926. Sadly, the film is apparently lost, with no known copies left. From the ad, it looks like a really funky movie. “One wild man—many wild animals—a naughty dinosaur—and a society deb looking for a thrill. Oh, spare us—we can’t mention it without laughing.” It is hard to think of the film’s story without laughing. Ben Lyon went on to star in the 1930 version of “Hell’s Angels.” May McAvoy went on to be in “The Jazz Singer” with Al Jolson. The venue is the Lindo Theatre. Martinsville Was “Switow’s Dream Theatre” from 1914 until 1917. Richmond Was “Murray Theater” from 1909 until 1930. Bedford Was “Stone City Opera House” from 1901 until 1924. Indianapolis (Marion Co.) Was “Gayety Theater in 1907. Period it was Indiana Theater unknown. Fort Wayne Was “Broadway Theatre” from 1923 until 1934. Theatres that are possible are bolded. So, the most likely “Indiana Theatres” were in Marian, Terre Haute, Kokomo, New Albany, and Bloomington. Bedford, Indianapolis, Chicago (IL), and Indiana (PA) are also possible but not quite as likely. The venue is probably the Indiana Theater, location unknown, After July 1924. 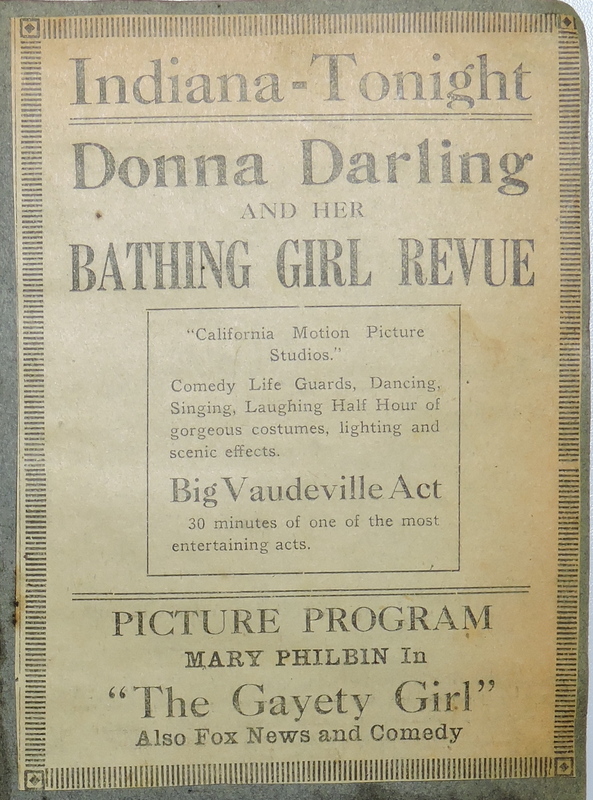 The show is the “Bathing Beauty Revue” starring Donna Darling. A lengthy search of Newspapers.Com , Newspaper Archives, Genealogy Bank, Chronicling America, and the Hoosier State Chronicles failed to yield any new information about the probable show location or date. Additionally, I didn’t see any advertisements for an “Indiana” theatre that used a similar font and design as the Donna Darling Collection clipping. Because newspapers from 1924 will fall out of copyright next year, and because so many publications are being added to the various newspaper services every year, I’ve decided to put this on hold and will return to it in the future.